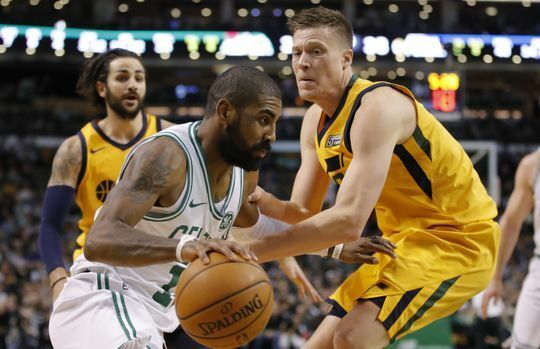 Our old pal Jonas Jerebko road into town last night and came up big for the banged up Utah Jazz, helping them to a win over the Celtics. Both Rudy Gobert and Derrick Favors left last night's game in the 1st half, instantly expanding Jerbeko's role against his old team. Jerebko responding by shooting 6 for 8 from the field for a season high 17 points and pulled down 7 rebounds along with a pair of steals and a block. Just as we all predicted, the Jazz are a championship team without Rudy Gobert and Derrick Favors. Jerebko was the missing piece. Jerebko is actually having himself a solid season thus far in Salt Lake City. He's averaging just 2 minutes more a game than he did with the Celtics just a season ago, but his scoring has nearly doubled (from 3.8ppg last year to 6.7ppg for the Jazz). This, in large part, is because his outside shooting has been way up. Jonas is shooting a career best 45.6% percent from three, while taking more attempts from the outside as well. He's averaging an even 5 shots from deep a night, up from 3.4 a year ago. Jonas Jerebko on time with Celtics: "I had three great seasons here. Playoffs every year. The fans are great. Organization's great. Good teammates, good coaches. I've got all good memories from here."